Are you in need of the best knife sharpener for survival knives? By their very nature, a survival knife is used out on the field, (for why would you be using a survival knife around the house?) and this means that very often, the best most reliable ‘portable’ knife sharpener is required. In this article we have rounded up the 5 best knife sharpeners for survival knives. 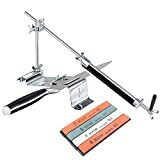 The table below lists each sharpener, (in no particular order we might add), followed by their full review details. I am a big fan of this little knife sharpener. 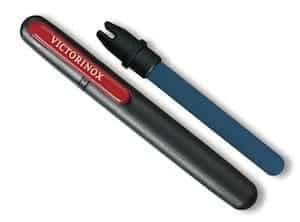 For a start you are getting the Victorinox design quality at a very affordable price. As compact as a fountain pen, it is unobtrusive and can fit snugly into your hunting bag, top pocket or where ever else you choose to store it while out in the field. The Victorinox pocket knife sharpener feels robust albeit its diminutive size. While testing, I used this on my Huntsman as well as my Camper Swiss Army Knives and it really does do the business. Utilising a V-groove sharpener and an Oval Rod, this is a really versatile tool that is extremely easy to use. Highly recommended. We’ve all seen Bear Grylls, rolling about in the mud, eating crustaceans for survival. The guy likes to go extreme at times. And of course on may adventures he carries a survival knife with which to aid him on his way. So how good is the knife sharpener endorsed by this popular TV survivalist? Well obviously good enough to make our top 5 table of best knife sharpeners for survival knives. The Gerber Bear Grylls field sharpener actually makes our list based on the glowing reviews it has obtained. Customers have been quick to state the benefits of owning this little tool. 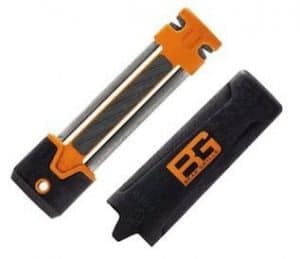 Gerber as a company is renowned for its series of survival knives and the quality they bring to the manufacture of those, has seen its way into the Bear Grylls Field Sharpener. Small and convenient to use, the tool is reliable for both serrated and straight edged knives. It also comes with a hard rubber handle, something which comes into its own when used outdoors in the wind and rain. The tool is packed with two rod shaped diamond coated sharpeners, that really will keep your survival knives in tip top condition. (Whether Mr Grylls really uses this bad boy out in the field is any ones guess however). Another tool from Gerber that makes our list is their 09841 diamond knife sharpener. This sharpener is very convenient to carry, (it is about the width of a standard pen) and features a pocket clip should you want to fasten it to your jacket pocket. 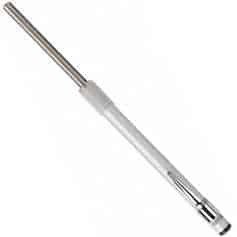 The sharpening rods also retract into the handle for easy accessibility and storage. Obviously designed for in the field maintenance the Gerber 09841 is ideal for quickly touching up both straight and serrated edge knives. The round shape of one side is used for serrated knives, while the flat side is designed to restore your straight edged blades. There is also a furrow for sharpening fishhooks and other sharp points. Again, generally positive reviews and a low price point basically mean you cannot go wrong if you end up with the Gerber 09841 Diamond Knife Sharpener in your kit bag. 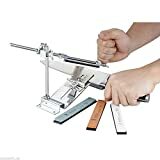 I have actually owned one of these for a while, and am comfortable recommending it as worthwhile addition to what ever knife sharpening tool you might currently use. The Wenger Super Sharpener is a diamond carbide knife sharpener and is ideal for survival knives. It is simple in design with a V-shape blade, and very easy to use hand grip style casing. When out in the field it is capable of giving all kinds of knives (including very importantly, serrated) the temporary touch up required. 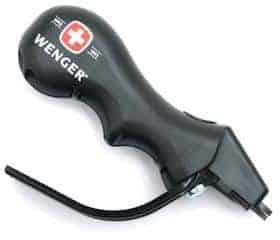 The Wenger Super Sharpener is present in our top 5 list mainly because I have used one for a long time and am really happy with its performance. A great little sharpener for any survival knife owner. 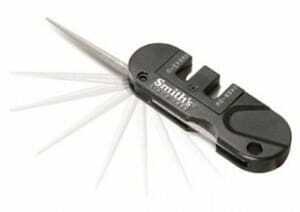 And quite honestly, if we were to choose the best sharpener for survival knives, from our top 5 list above, the Smith’s PP1 may very well obtain the crown. Its multifunction aspect really does make this tool shine as far as pocket knife sharpeners go. Now that I have one, it is the sharpener that I use most while out on the field. So what are you getting if you purchase the Pocket Pal? Well there is a carbide sharpening stage for dull or slightly damaged blades that require a new edge. And this can definitely happen with survival knives while on the go. This stage is for straight edge knives only, and I have found it to be quite aggressive at times. However, for fast and simple sharpening it cannot be beaten. The PP1’s next stage consists of ceramic stones that provide polishing for both straight edged and serrated blades. The tool also contains a round, tapered diamond coated rod for sharpening serrated edges. What is really great with the Smith’s PP1 Pocket Pal is the fact both the carbide blades and ceramic stones are reversible and replaceable, meaning you can really keep on using this little beast for years to come. Weighing in at less than one ounce, this compact little sharpener is really perfect for field use and its versatility for all manner of survival knives make it the one to buy.